Special days are need to be treated in a special way, if its a birthday and we dont live near or next to the birthday gal its definitely a better and best way to shower the love we have for them is by wishing them on their birthday virtually. Actually today one of my blogger buddy is celebrating her birthday. My days will be long if i dont speak to her, i feel sad if i dont see her in online, you can guess how important she is. We are best buddies since years eventhough we never had a chance to meet personally, but it doesnt matter friendship dont have boundary and doesnt need to meet face to face, just a fone call or a online chat is enough to grow up this beautiful bond between two persons who shares the same passions. 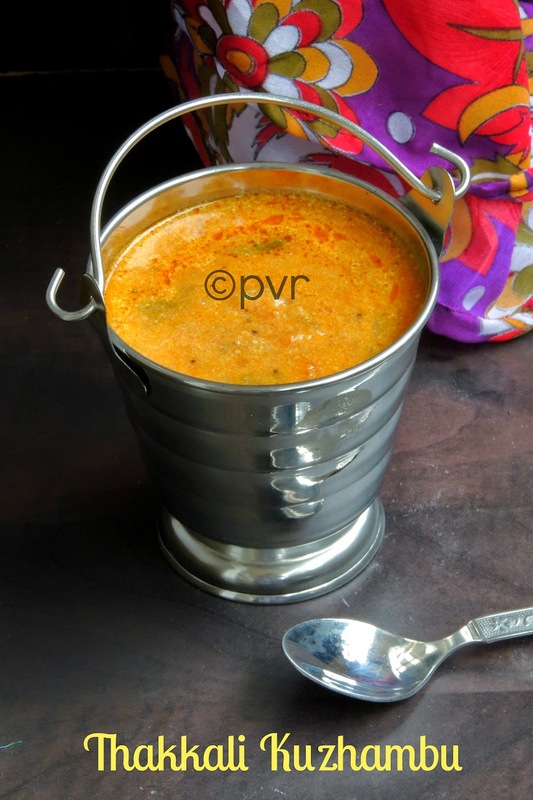 Am talking about Sangee Vijay of Spicy Treats, she is celebrating her birthday today and few of us are going to celebrate her birthday virtually by cooking dishes from Kongunadu, where she comes from.I chosed few dishes from her space but i ended up with this fingerlicking gravy with tomatoes. This dish is very special to Sangee, its her dad's dish obviously i want to cook it specially for her on this special day. 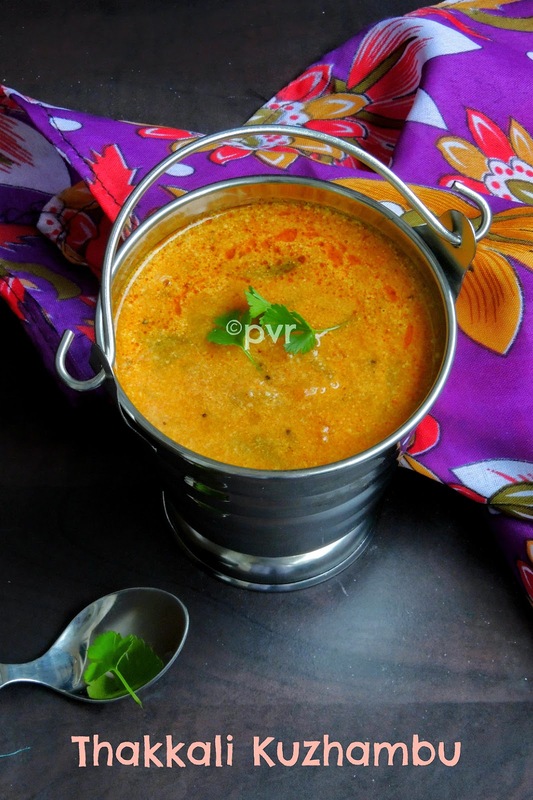 This kuzhambu tastes soo delicious with rice, actually i do make this kind of gravy with tomatoes, but this dish is different from what we usually prepare. This gravy goes for boiled,pureed tomatoes, which definitely makes the difference from the usual ones. Grind the coconut and poppy seeds as fine paste with enough water,keep aside. Drop the tomatoes in boiling water, once you can see the skin of the tomato peels off, switch off the stove. Transfer it to chilled water, remove the skin and blend as puree. Heat enough oil, add the mustard seeds, fennel seeds,let them splutters. Add the crushed ginger,garlic,curry leaves, saute for few minutes. Now add the chopped onions, cook until the onions turns transculent, add the spice powder, cook for a minute. Add the tomato puree,half a cup of water, turmeric powder, salt and let it boil. Finally add the coconut paste, enough water, cook in medium flame until the gravy gets slightly thick. Put off the stove, add the coriander leaves. Stir and serve with rice. Kuzhambu looks simply superb.My wishes to Sangee Vijay. I like ths curry a lot. My grand ma used to prepared this curry. Still the taste in my tongue. Very tasty wt Hot steamed rice. Delicious and flavorful kuzhambu, just need a bowl of rice.. 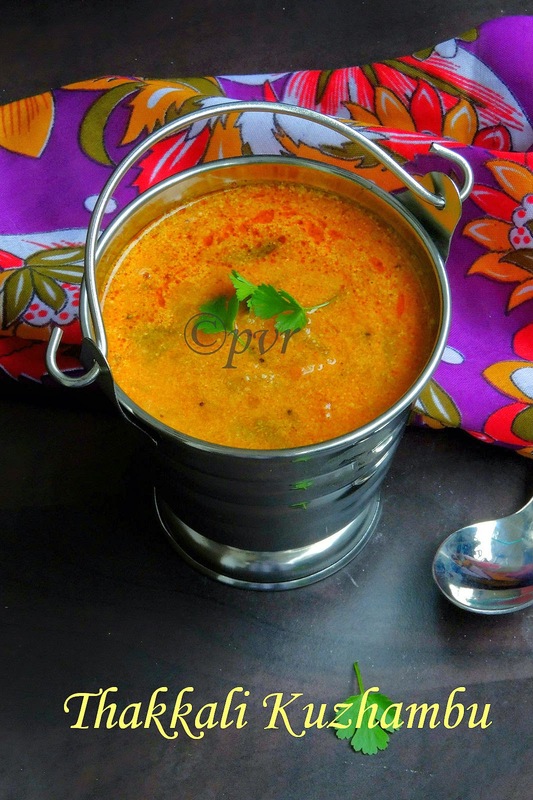 This tomato curry looks very delicious, Priya. Loooove Kuzhambu and pairing it with tomato makes it irresistible. lovely post. I agree friendship needs no boundaries. I love tomatoes and this dish sounds awesome. Love it! I can have this right now! I can just imagine pouring that curry on top of steaming rice and enjoying. happy birthday to your friend. My husband's favourite curry. Very apt for rotis and idli dosai. Great friendship .